As you may know, Craig specialises in unique, unconventional knitwear. If having graduated from Central Saint Martins, and creating knitwear for Gareth Pugh for six seasons aren’t sufficient as design creds for you, you will find seeing is believing. Believe me. Craig keeps exploring ways to reinvent his craft, to come up with “voluminous, fluffy and shiny” results and then some, previously unheard of in the realm of knitting. This season, inspired by the moon at twilight, madness in the night and his darker side, he presented beautiful, dramatic pieces with different layers, patterns, textures, structures, adding up to truly intriguing silhouettes. I am very much drawn to the midnight coloured pieces with black knitted (and some chainmail-effect) overlays, exuding mystery and tactile, dark and cool references of earth, water and air, some heavy, some feather-light, all with a soft sheen. It reminds me of trees, cottages, churches, forest clearings, landscapes, and figures moving across the scene bathed in moonlight. A bit like gazing at clouds - things you imagine, things you see and admire for their sheer beauty, even though you cannot quite make them out. You’ve got to feel your way through, but it’s definitely worth it. Soft deconstruction, Asian-inspired pieces, elongated silhouettes in white, black, dark camel and dove grey prevailed at the fashion week presentation of Korean designer Jackie Lee. 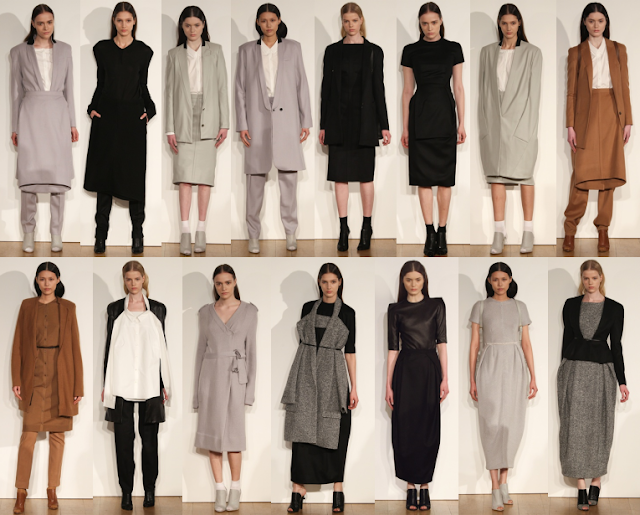 The 2010 Central Saint Martins graduate and huge fan of jazz continues to bring us chic minimalism, while playing around with oversizing and new cuts (note the skirt overlays and the shift dresses, shapes inspired by Picasso’s ‘Guitar’ and shirts). My favourites are the fitted dress, the black leather tee, the grey shift dress and the leather skirt suit. Oh, and the black cutout front blazer on top of the tweed dress. The result of Jackie’s latest endeavour is pared-back and edgy, the purest way to showcase personal style. 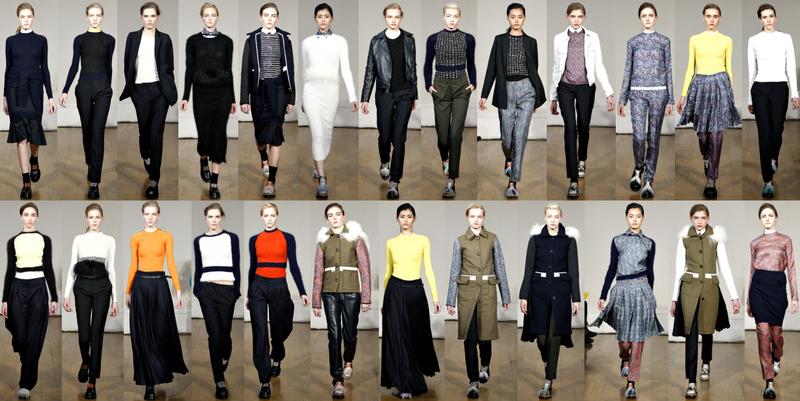 Following the success of his mens collection, Anderson took the plunge in the world of womenswear design for a/w 2010. With a signature style covering things that can be borrowed between a man and a woman, I couldn’t wait what he had in store... Inspiration came from geometry, stately homes, Lost In Translation, Smiths fans and Eastern European subcultures, concepts that ended up in a collection titled “The Fear Of Naturalism”. I’m a huge fan of tailored boyish trousers, so I definitely got my share there. To complement them, there was cool knitwear and simply cut jackets, before the looks seasoned with paisley print, heritage check, furry details (even on shoes! ), half-skirt overlays, contrasts, colour blocks of yellow, orange and red against black cheerfully exploded in my face. Oh, and another plus: a lot of Dr. Martens (style) boots and shoes. A new youth culture? Possibly. Giving in to all sorts of norms is not an option. The young (and any grow-up-phobes out there, yours truly included) must know by now that crossing over to the dark side is not the way to rebel against the dullness of society or laugh in the face of expectations – just the opposite in fact, as the norms of previous rebels can be as binding as anything else. Being young is being free of it all, just as this collection suggests. 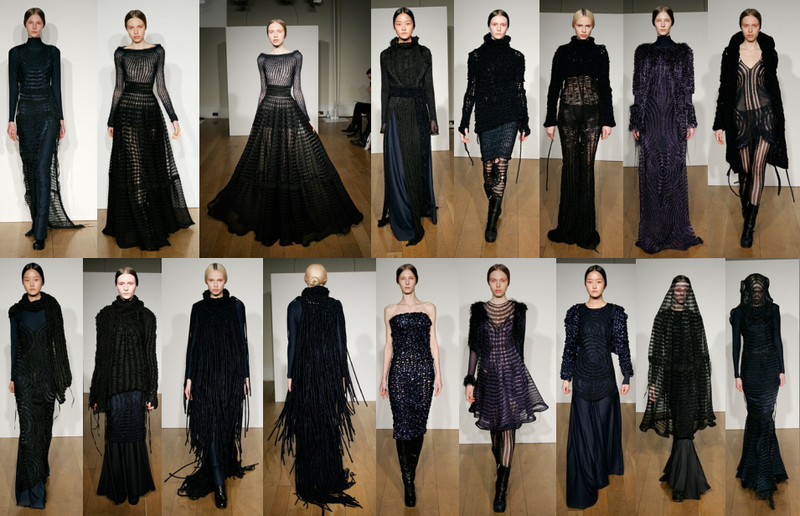 Craig Lawerence did a great job with using black in his collection. Its borders on the gothic end, but as you also mentioned, it touches on more elemental things. But also light and airy.